This railway is closed. The railway provided a service from Boddam to Ellon with connections to Aberdeen. A hotel was built at Cruden Bay and had an electric tramway service. The line was owned by the Great North of Scotland Railway. The photograph below shows one of the few remains, the goods shed at Hatton. 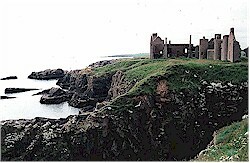 Slains Castle (near Cruden Bay) which inspired Bram Stoker in the writing of Dracula. This line runs from Ellon to the coast at Boddam just south of Peterhead. The line was built by the Great North of Scotland Railway. The route was from Boddam to Ellon. From Ellon connections were available to Aberdeen. Express services used to run in connection with the Great North of Scotland Railway's Hotel at Cruden Bay. An Electric tramway connected Cruden Bay station to the Hotel and was used for passenger, goods and laundry traffic. Goods services consisted of one up and one down train per day. Judging by the weather in this area there is little left of the line due to the strong winds rather than the long period of closure. This station was the junction between the Formantine and Buchan Railway and the Great North of Scotland Railway's Boddam branch. At the time when the station was converted into a junction the GNSR owned the F&BR. Please see the entry for Ellon on the F&BR page. "The view is from the road bridge at the Palmer wood to the West of the old station. The buildings are the cottage for the railway ganger and behind that, the stationmaster's house. The station was a wooden building which was 100 yards distant from the stationmaster's cottage. A siding was behind the station. The last stationmaster was Mr. Park and David Reid was the last railway employee to live at the cottage. It was acquired by the Auchmacoy Estate." This station has largely disappeared. The photograph shows the station as viewed from a roadbridge to the south. A building, now a large house, of a suitable age is out of view to the right. The goods shed remains at this location as part of some business premises. The station has been eradicated. The photograph shows the goods-shed looking from the North-East. The platform was once in the foreground and station building to the right. Nearby there still remains a Station Hotel. The was the station for the Cruden Bay Hotel. From here a tramway ran to the hotel. The station had two platforms and a series of rail and tramway sidings. Sidings also existed here for the Cruden brick company whose were associated with the construction of RNAD Lenabo. The tramway which ran from here to the Great North of Scotland Railway's Hotel was electric. At the station end sidings and a loop existed with a platform at the back of the Up platform of the railway station. At the Hotel end there was a two road shed, laundry sidings and siding at the main entrance for passengers. Some further sidings were added at the Laundry after opening. The tramway was closed to passengers at the same time as the Railway and closed to freight some four years before the railway. The Hotel and tramway were used by the Army during both World Wars. The Hotel was demolished between 1947 and 1952. Portions of the Hotel were used in Charles Alexander's house at Bush near Montrose. Apparently some of the trams can be found in the gardens of houses near Hatton. A confusing road called "Station road" appears to lead to the old station site but does not quite. The station site (beyond the old house near the end of Station road) has been landscaped and now has a large house built on it. From the edge of a nearby cutting (to the South) a general view of the layout can still be guessed. One or two piers from a large viaduct remain to the North of the station site. The photograph shows the view from the South of the station. The platforms were on a curve sweeping left on the left hand side. A building existed on each platform. To the left the remains of the large viaduct the line led onto are just out of shot. The building at the top right existed in railway days and was probably for station staff. This narrow-gauge railway was opened in 1980. The line went from Cruden Bay to Slains Castle. The track was moved to Banff to become the West Buchan Railway in 1984. The West Buchan Railway closed in 1985. The railway crossed the road at this point. The railway embankment has been removed for a long distance so the exact location of the station can only now be guessed at. The photograph shows the railway trackbed approaching the demolished section. The view looks North towards a quarry, seen at the top right. The road to the right leads to Bullers O' Buchan. A nearby set of sidings were used by Longhaven Quarry. The photograph shows the probable location of the station from the North. The site is a level crossing by a hotel. A hotel remains at the site of the station. Of the station itself very little can be discerned. A substancial Police building with security fences now occupies the site. The photograph shows the probable location of the station, viewed from the North. The security compound of the Police building is at the top right.